Cook pasta in a saucepan of boiling water, following packet directions, until tender. Drain and set aside. In a frypan over low-medium heat, heat oil and add mushrooms, spring onions, zucchini and capsicum. Stir occasionally for around 5 minutes until ingredients have slightly softened. Add cooked pasta, pesto sauce and cottage cheese to frypan. Toss well and dish into bowls along with a large serve of green salad or green vegetables. Serving suggestions: Cook some ham or bacon into the mix along with the mushrooms. 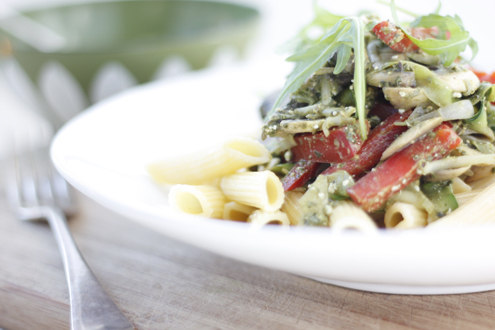 How much cottage cheese did you use I the creamy pesto penne with mushroom recipe?